The engineers at Dassault began work on an a fighter-bomber version of their Mirage III not long after the Mirage IIIC entered production. One distinctive update was a small fuselage plug behind the cockpit to enlarge the avionics bay and fuel capacity. This change launched the highly successful Mirage IIIE. The Mirage 5 replaced the avionics bay behind the cockpit with additional fuel capacity and added two additional weapons pylons to the wing. While the Mirage 5 was initially limited to clear weather air-to-ground missions, mid-life updates and the ever-shrinking size of avionics allowed some aircraft to have all-weather air-intercept capabilities as well. 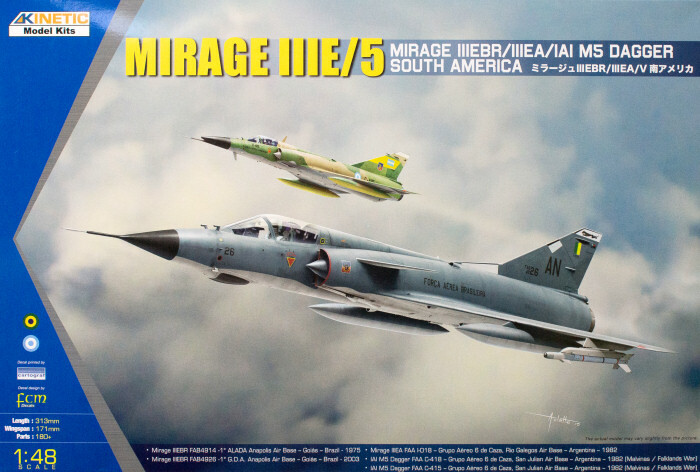 Here is Kinetic Models' fighter-bomber Mirage IIIE/Mirage 5 kit which follows the Mirage IIIE/O/R/RD release as well as the recent Wingman Models Nesher/Dagger release. The kit is molded in light gray styrene and presented on 10 parts trees (duplicate trees not shown) plus one tree of clear parts. The surface of the model is smooth and details are finely scribed. This model is ready for bare metal or camouflage. These decals are designed by FCM Decals and are nicely done. 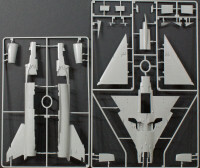 The sheet includes a nice suite of airframe stenciling - painting instructions are provided using FS 595 colors. This is another very nice release from Kinetic and adds the Latin American variants to the menu.